Support Library All Articles Family & Friends Employers and Colleagues Our Employee’s Child Has Died – How Can We Help? The death of a baby or child can be a devastating experience. Grief can take over the whole being, and it is not uncommon for bereaved parents to feel pain and despair, anger, guilt, panic, confusion, forgetfulness and more. In addition to the loss of a baby or child, the parents face the loss of future hopes and dreams. There is no right or wrong way to grieve—nor is there a set timetable for grief. How a person expresses grief may be influenced by many factors, including culture, beliefs, previous losses, current circumstances and their individual personality. Death is a difficult subject, one which can be frightening and unfamiliar to many people. The family‘s world is turned upside down. Sometimes it is hard to know what to do or say to someone whose baby or young child has died. Yet we know that the strength and effectiveness of the support received from others can assist the healing process. The immediate and subsequent days, weeks and months following the death of a child are a time of great pain and confusion for a bereaved parent. These times are also a source of tremendous uncertainty for those around them as they grapple with a sense of helplessness watching their friend and colleague navigate this painful experience. Having a compassionate and understanding workplace is often the difference between being able to resume a new ‘normal’ life (life as a newly bereaved parent is never as it was but can eventually become a new ‘normal’ as they move through their grief journey) and struggling to balance returning to work, supporting their family and dealing with their unimaginable grief. There are no hard and fast rules – each circumstance brings its unique challenges. We hope the following suggestions will help you negotiate the days, weeks and months ahead in a way that benefits both your employee and your workplace. It will not be easy but the outcomes will be worth more than words can say. If you have a bereavement guideline in place, this will guide you with what your workplace can offer your bereaved employee. Let them know what the provisions are – knowing the company is willing to support them can relieve additional stress arising from worrying about work and dealing with the initial aftermath of their child’s death. Bereavement leave - While the National Employment Standards (NES) dictate three (3) days, you may consider increasing this or having a flexible arrangement in consultation with your bereaved employee. They may need more than the policy provision and the ability to tap into other leave entitlements (annual, sick, long service, unpaid, etc) is a way to extend their time off. Donation of leave - If colleagues wish to support by donating a portion of their leave entitlements, this can be a provision in the guideline. Managerial discretion - Provisions for extended leave at the organisation’s or manager’s discretion can be included. Employee assistance program (EAP) - If an EAP is offered to employees, ensure this provision is clearly noted. If fellow workers are affected by the bereavement, ensure they know the EAP is also available to them. If an EAP is not currently available, consider providing one. Practical needs - Consider the practical ways you can offer support. As these should be flexible to suit each employee’s circumstance, a general clause could be included in the guideline to indicate practical support is offered. Specifics can be included in the related procedures. Guidelines should be written in clear and concise language and be easily accessible to all staff. The first phone call and how it is handled cannot be underestimated. Acknowledging the child’s death and offering support and understanding in those first few moments is critical. Let them know you and their colleagues are ready to help in whatever way they need without pressure or expectation. No matter how brief the contact, those thoughtful gestures will always be appreciated and remembered even if it doesn’t appear immediately obvious. Ask them if you can call them every few days to see how they are going. Although each one of us will experience the death of someone close to us at some point in our life, death can be a difficult subject to broach and even harder to deal with. It is important to understand grief is a very personal journey. No two people grieve in the same way or for the same time. Seek basic bereavement professional development - Organisations such as Red Nose Grief and Loss, The Compassionate Friends (TCF) or the Australian Centre for Bereavement and Grief (ACBG) can provide professional development sessions. If you have established they are comfortable with your staying in touch, ensure you make regular contact. Rather than numerous staff members contacting them, one staff member can be nominated as the point of contact. This reduces the risk of miscommunication and retains consistency on both sides. The bereaved parent knows they only have to speak with one person and the contact person can be the conduit for the rest of the staff. Reassure your employee that the workplace is willing to accommodate their return to work. Consult with them about when and in what capacity they feel ready to come into the work environment. Offering flexibility such as reduced hours or flexible start and/or finish times and letting them know if they need to take time off at short notice, that the organisation is supportive is critical in getting the employee back to work. Arrange for other staff to assist them with their duties and there will be no expectation they need to pick up where they left off. Walking through the door after such a traumatic experience is a real act of courage but not without many fears about how they will cope with the transition back to their workplace environment. As an employer or manager, there are many things you can do which will ease your employee back and ensure they feel supported with realistic and workable solutions. Ask your employee what they feel would help them with that first day – don’t assume you know what they need. Acknowledging the effort it takes to show up every day goes a long way to helping them feel valued. Be aware they may ‘break down’ and, if possible, provide a quiet space to which they can retreat. If they realise they are unable to work a whole day, let them know they can leave when they need and that their colleagues will help them to complete their duties. Understand that support may be ongoing for some time. Above all, be available – this is invaluable in assuring your employee that they are an important part of the workplace. It is so important to keep the channels of communication open, thoughtfully and honestly. Listen to what your employee is actually saying they need. Let them know your door is always open. Send a staff email letting workmates know their colleague is returning and asking them to be supportive, sensitive and understanding. Check with the bereaved parent if they are comfortable with people speaking of their child – often people feel awkward and avoid mentioning the child’s name but from experience, we know that acknowledging their child is something that helps enormously. Ask staff to assist should their colleague need to leave at short notice. It is important to be respectful and respond in an empathetic way. Allow them their privacy and don’t make assumptions about their feelings or needs. Ask and listen. Do not avoid them – it is as equally uncomfortable for them as it is for you; however, to be avoided or ignored is far more isolating and painful. There are no ‘right’ words but platitudes such as “It could be worse” or “It was God’s will” for example are inappropriate. When we see someone in pain, it is our natural inclination to want to ‘fix it. Unless they ask, don’t offer advice – your support and understanding is far more valuable. Other cultures grieve and mourn in different ways and it is important not to impose your beliefs or views at this time. Grief is an individual experience and no loss is any greater or any less than another – try not to compare and don’t take outbursts personally. Strong emotions are in play and these should not be judged as a personal slight. Even if the bereaved parent does not work closely with all members of your team, the ‘ripple’ of a death can have far reaching effects. Be aware that work performance, which can impact health (mental and physical) and safety in the workplace can be affected. Especially for the colleague who is the principal contact or has a close working relationship, ensure they are given the opportunity to debrief and seek support. Grief is a long, long journey – one doesn’t ‘get over it’ in a week, a year, or even a lifetime. While life can return to a new ‘normal’, it is never the same and grief can intrude into ‘normal’ life at unexpected and inconvenient times. Continue to be encouraging and acknowledge the strength it takes to return to work. 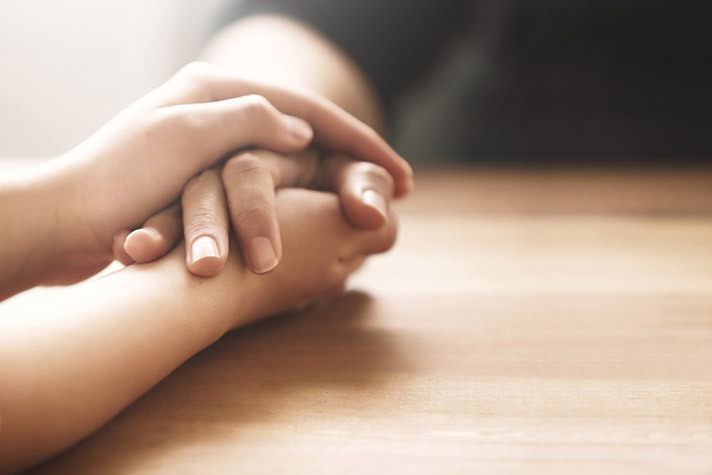 Fostering a compassionate and understanding environment takes time and commitment from all involved but your employee needs your ongoing support and empathy beyond the initial mourning period. To prevent ‘compassion fatigue’, it is important to take care of yourself. This also applies to the remainder of your team.